second round play. 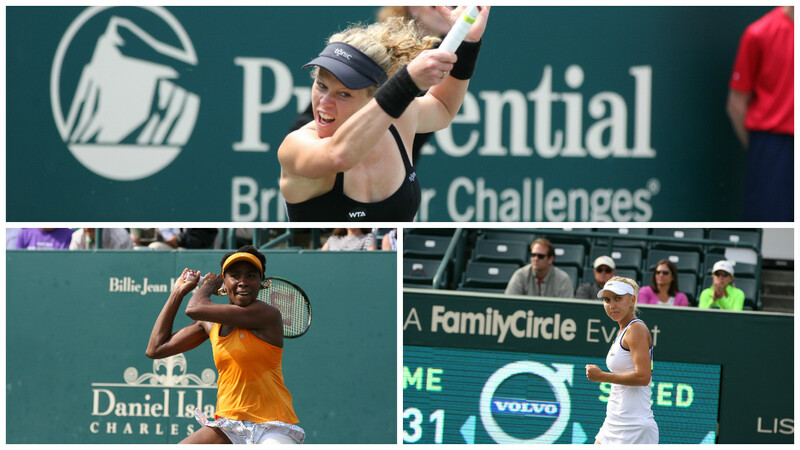 Williams defeated countrywoman Alison Riske 6-4, 6-2, and Stosur defeated 2014 runner-up Jana Cepelova 6-4, 7-5. Cepelova entered this year's main draw as a lucky loser. 2011 runner-up Elena Vesnina (who won the doubles title that year with Sania Mirza), advanced when she defeated 2nd seed Belinda Bencic. Bencic was troubled by the back problem she experienced when she played in Miami. Qualifier Vesnina, on the other hand, was in fine form, beating Bencic 6-1, 6-1. Another former finalist who was defeated today was Lucie Safarova, who lost to wild card Louisa Chirico. Safarova, who was out for several months because of two serious illnesses, was the runner-up in 2012. Laura Siegemund, the 28-year-old German who is ranked number 75 in the world, has been showing us quite a bit of good tennis lately. Today in Charleston, on Billie Jean King Stadium Court, Siegemund outlasted 8th seed Madison Keys in a match that went on for over two hours and 48 minutes. The German player needed six match points to prevail, but she stayed as steady as anyone could have--even when she found out that what she thought was the winning fourth match point wasn't converted when the chair umpire overruled a call. It was a good match and an entertaining match. Siegemund served extremely well, and she used a lot of variety in constructing points, slicing and lobbing to keep points going. Her drop shots were especially effective. In the first round, Siegemund needed almost two hours and 44 minutes to claim victory. On the other end of the spectrum, Daria Kasatkina has given up only five games in her two Volvo Car Open matches. Sloane Stephens, looking for a victory in what she says is one of her favorite events, got just that. Stephens defeated Danka Kovinic in straight sets on Billie Jean King Stadium Court. 2009 champion Sabine Lisicki lost to Yulia Putintseva, and Irina-Camelia Begu defeated Bethanie Mattek-Sands in a match that went on for almost two and a half hours. One other qualifier, Kristina Kucova, advanced when she defeated Kateryna Bondarenko. Daria Gavrilova defeated Zhang Shuai 6-4, 6-0. And totally under-the-radar 5th seed Sara Errani beat Yaroslava Shvedova 6-0, 6-3. Genie Bouchard, whose luck seems to go from bad to worse, had to retire after the first game of her third set against Lourdes Dominguez Lino. The back issue that bothered the Canadian star in Miami flared up, and--as much as she wanted to go on--Bouchard had to stop playing. In the night match, 2014 champion Andrea Petkovic was upended by Monica Puig, who won five games in a row when she was 2-5 down in the first set. Between sets, Petkovic was visibly upset with herself, and her demeanor carried over into the next set, which was more or less all about Puig. Toward the end, Petkovic rallied, saving two match points, but she was unable to stop her opponent, whose accuracy and tenacity gained her a 7-5, 6-2 victory. In doubles, top seeds Bethanie Mattek-Sands and Lucie Safarova won their first-round match against Andreja Klepak and Katarina Srebotnik, and 4th seeds Raquel Atavo and Abigail Spears defeated Lara Arruabarrena and Raluca Olaru. The night match featured Australians Casey Dellacqua and Samantha Stosur against the French team of Caroline Garcia and Kristina Mladenovic. Garcia and Mladenovic won 7-5, 6-4. Their next opponents will be composed of two Russians--Daria Kasatkina and Elena Vesnina. Defending champion Angelique Kerber will face qualifier Kristina Kucova tomorrow in the third round. Venus Williams will play Yulia Putintseva, and Sara Errani will compete against Sam Stosur.